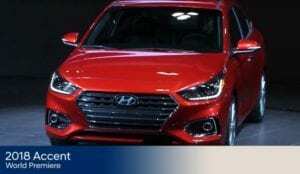 The next-generation Hyundai Accent has expanded its advanced high-strength steel content to 54.5 percent of the subcompact car, up from 41.5 percent, Hyundai announced as it revealed the car at the Toronto Auto Show. The car will go on sale globally in the third quarter of the year. Nearly 80,000 were sold in 2016. Hyundai can produce the steel itself, which might explain the large amount in the existing vehicle. “The application of Advanced High-Strength Steel improves collision performance without adding unnecessary weight, which helps reduce fuel consumption and deliver better driving feel,” the OEM wrote in a news release. Hyundai said it also boosted torsional rigidity by 32 percent from the 2017 Accent through 98.5 meters of structural adhesive, contributing to the better ride. Advanced high-strength steel typically starts at around 590 megapascals, and OEMs typically place restrictions on the light, strong metal’s straightening, sectioning and heat exposure — if they don’t declare the parts replace-only from the start, particularly at higher tensile strengths. A repairer can also at least make sure to have on hand the kind of training foundation and equipment Hyundai requires of certified shops. A standard backup camera, required on all vehicles as of May 1, 2018. Some of these trims include what Hyundai says is a “segment first” option of autobraking, which relies on cues from front-facing radar. The Accent is a subcompact, budget car — only the 2017 sport edition cracked $17,000 — and it’s still more than 50 percent advanced high-strength steel and likely to be tricked out with advanced safety technology. That’s a remarkable symbol of how far vehicles have come and how much skill collision repair now requires.